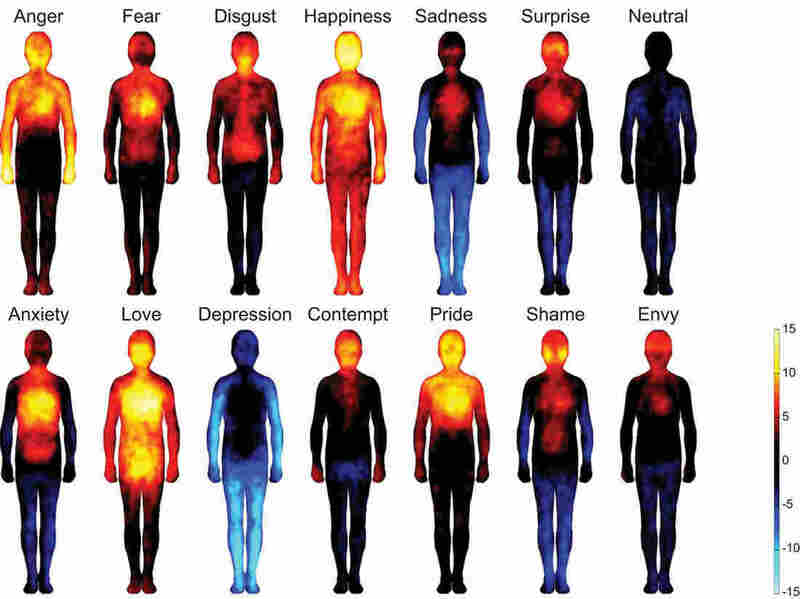 Mapping Emotions On The Body: Love Makes Us Warm All Over : Shots - Health News How do you know you're in love? Angry? Or sad? Emotions start off in the brain, then ripple through the whole body. Now scientists have charted where we consciously feel specific emotions. They hope these sensation maps will one day help diagnose and treat mood disorders. "Our emotional system in the brain sends signals to the body so we can deal with our situation," says Lauri Nummenmaa, a psychologist at Aalto University who led the study. "Say you see a snake and you feel fear," Nummenmaa says. "Your nervous system increases oxygen to your muscles and raises your heart rate so you can deal with the threat. It's an automated system. We don't have to think about it." That idea has been known for centuries. But scientists still don't agree on whether these bodily changes are distinct for each emotion and whether this pattern serves as a way for the mind to consciously identify emotions. The team showed the volunteers two blank silhouettes of a person on a screen and then told the subjects to think about one of 14 emotions: love, disgust, anger, pride, etc. The volunteers then painted areas of the body that felt stimulated by that emotion. On the second silhouette, they painted areas of the body that get deactivated during that emotion. The team still doesn't know how these self-reported sensations match with the physiological responses that occur with emotion. But previous studies have found marked changes in bodily sensations in mood disorders, Nummenmaa says. "For instance, with depression sometimes people have pain in their chest." And there's even some evidence that when you change your own body language — like your posture or stance — you can alter your mind. Neuroscientist Antonio Damasio, who was not involved in this study, says he's "delighted" by Nummenmaa's findings because they offer more support for what he's been suggesting for years: Each emotion activates a distinct set of body parts, he thinks, and the mind's recognition of those patterns helps us consciously identify that emotion. "People look at emotions as something in relation to other people," Damasio, who is a professor at the University of Southern California, says. "But emotions also have to do with how we deal with the environment — threats and opportunities." For those, Damasio says, you need your body as well as your mind.